"This hotel is like new." "Awesome room, pool, location, food and staff." "Good location and cosy stay"
"The rooms are decorated in a beautiful blue theme." 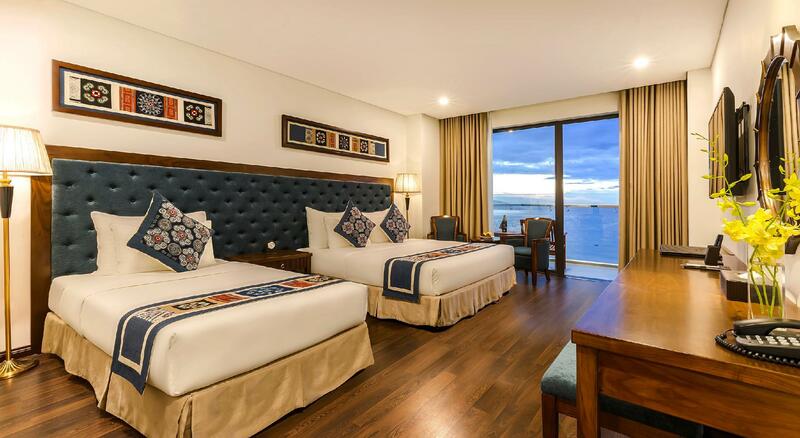 Located in the Phuoc My area, Balcona Hotel Da Nang is the ideal point of departure for your excursions in Da Nang. The excitement of the city center is only 4 km away. With its convenient location, the property offers easy access to the city's must-see destinations. Take advantage of a wealth of unrivaled services and amenities at this Da Nang property. 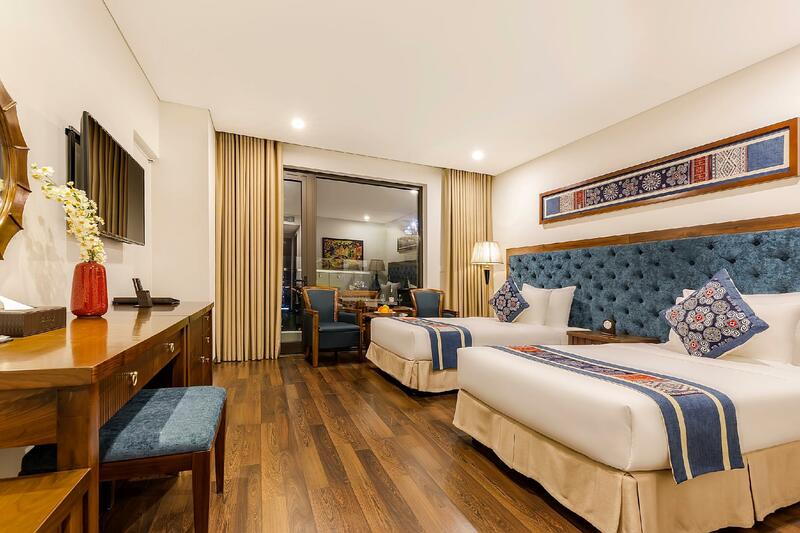 For the comfort and convenience of guests, the property offers free Wi-Fi in all rooms, 24-hour room service, 24-hour security, daily housekeeping, fireplace. 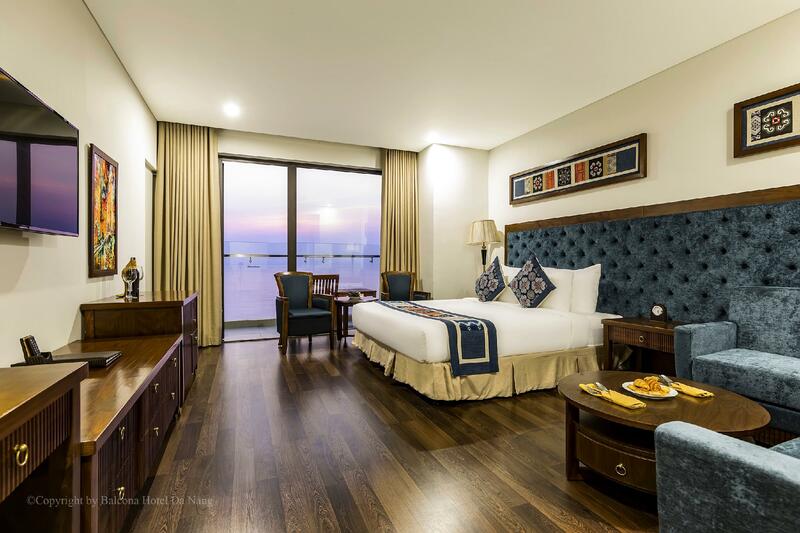 215 rooms spread over 22 floors provide a warm and pleasant home away from home. 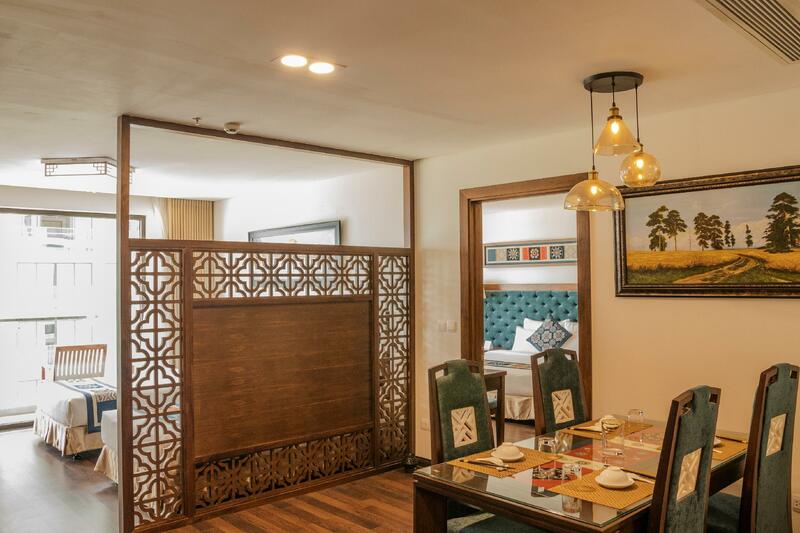 Comforts such as flat screen television, additional bathroom, additional toilet, bathroom phone, clothes rack can be found in selected rooms. The property's hot tub, sauna, outdoor pool, spa, massage are ideal places to relax and unwind after a busy day. 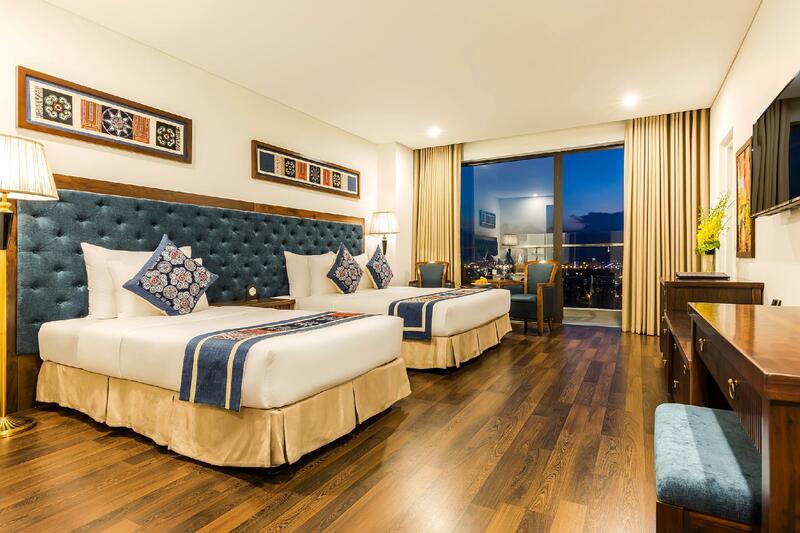 Whatever your reason for visiting Da Nang, Balcona Hotel Da Nang is the perfect venue for an exhilarating and exciting break away. "Breakfast was included and there is a nice lady"
Infant 0-1 year(s) old stay for free if using existing bed. Children 2-5 years old stay for free if using existing bed. Children 6-11 years old will be charged VND 150,000 per child per night when using existing bed. 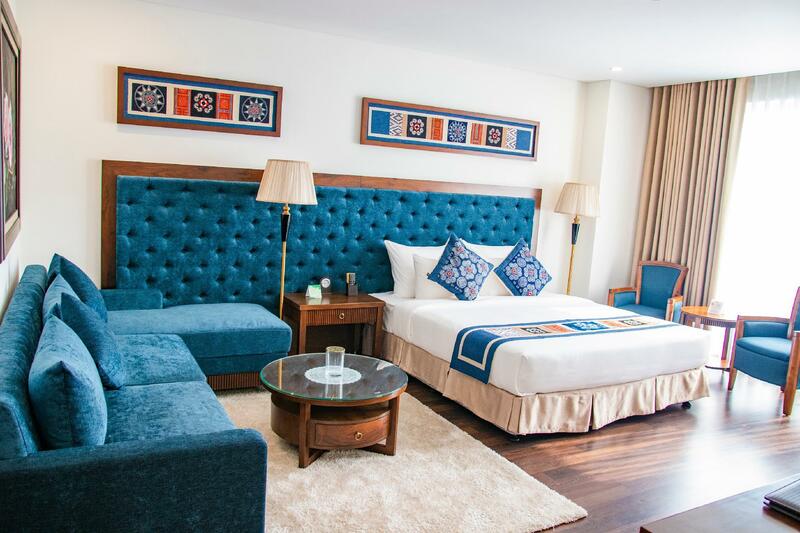 Children 12 years old and above will be charge VND 350,000 when using existing bed. The sea view from my room's balcony is superb. The infinity pool on 20th floor is also stunning. Location is convenient, very close to My Khe Beach. The complimentary breakfast buffet has wide variety of food to choose from. Every thing is good here! Dear Cheuk, Warmest Greeting from Balcona hotel Da Nang. We would like to express our sincere thanks for choosing our hotel for your stay in Da Nang. It’s delighted to hear that your recent stay with us at Balcona hotel was a thoroughly enjoyable experience. It was wonderful to read your comments and rest assured that I will share your feedback with the team who take great pride in ensuring each guest has a memorable stay. We are looking forward to welcoming you back to our hotel in the near future. Sincerely, From Balcona hotel Da Nang Team with love. Daisy. The rooms are large and the room we had faced the ocean, it was a beautiful view. The beds are comfortable. The location is great, several restaurants in walking distance and the beach is right across the road. Dear Thomas, Warmest Greeting from Balcona hotel Da Nang. We would like to express our sincere thanks for choosing our hotel for your stay in Da Nang. It’s delighted to hear that your recent stay with us at Balcona hotel was a thoroughly enjoyable experience. It was wonderful to read your comments and rest assured that I will share your feedback with the team who take great pride in ensuring each guest has a memorable stay. We are looking forward to welcoming you back to our hotel in the near future. Sincerely, From Balcona hotel Da Nang Team with love. Daisy. The best view, best room, very clean, superb staff, great breakfast, awesome gym with a view, great fun for kids. I couldn't find a single bad thing about this hotel experience and I am a fairly discerning traveler. Dear Theruvath, Warmest Greeting from Balcona hotel Da Nang. We would like to express our sincere thanks for choosing our hotel for your stay in Da Nang. It’s delighted to hear that your recent stay with us at Balcona hotel was a thoroughly enjoyable experience. It was wonderful to read your comments and rest assured that I will share your feedback with the team who take great pride in ensuring each guest has a memorable stay. We are looking forward to welcoming you back to our hotel in the near future. Sincerely, From Balcona hotel Da Nang Team with love. Daisy. The location is great, beach front. Hotel is supposed to be new but there are some cracks in the walls in the room. However it's made up for by great friendly staffs. The Spa is awesome and great price! We have stayed at this hotel for three days. If I knew about this hotel earlier, I should take longer staying at there. The Hotel was tally new so the facilities were all fancy and clean. The local was the best. Just in front of beach and easy to take taxi or Grab service. The staffs were all kind and did fast action about my request. Especially Ms. Hai Ha gave us warm hospitality and checked all our needs. The image of the staff is very important for new comer, so we feel the hotel gave a proper training for all staff from entrance to the room service. We had a good time even only three days short time at there. I'm recommend to stay at this hotel. One thing, we enjoy to have moon light at night, but our balcony faces to the next hotel which decorates with colorful too-much-bright neon sign lamps for over night. It made us block all windows to hid from the light-pollution from the beside hotel. That's the only inconvenience for us. Dear Kwangil, Warmest Greeting from Balcona hotel Da Nang. We would like to express our sincere thanks for choosing our hotel for your stay in Da Nang. We are so happy to hear that you really enjoy at our hotel. Your compliments about our facilities ( swimming pool, our room, staff ) and service will be our motivation. It was wonderful to read your comments and rest assured that I will share your feedback with the team who take great pride in ensuring each guest has a memorable stay. We are looking forward to welcoming you back to our hotel in the near future. Sincerely, From Balcona hotel Da Nang Team with love. Daisy. What a value !!!! This hotel is like new. Everything is spotless. From the lobby to the infinity pool on the top, the staffs did an excellent job in keeping it clean. The location is convenient. You can swim with the locals in the beach in front. Seafood restaurants are plentiful within walking distance. I got a room with balcony. Sea view is spectacular. Breakfast buffet was delicious. The selections were abundant. Lots of Vietnamese foods plus Korean foods. Lastly, the lobby staffs were very nice and courteous. I would definitely come back and recommend this hotel to friends and family. Dear Tu, Warmest Greeting from Balcona hotel Da Nang. We would like to express our sincere thanks for choosing our hotel for your stay in Da Nang. We are so happy to hear that you really enjoy at our hotel. Your compliments about our facilities ( swimming pool, our room, staff,... ) and service will be our motivation. It was wonderful to read your comments and rest assured that I will share your feedback with the team who take great pride in ensuring each guest has a memorable stay. We are looking forward to welcoming you back to our hotel in the near future. Sincerely, From Balcona hotel Da Nang Team with love. Daisy. I went on a spontaneous trip to Danang and it was the BEST! Without much knowledge of the city, it all came together with the help of the Balcona--they were essential in all the ins and outs, with total kindness, professionalism and accuracy. I loved my room--the view of the ocean from my bed was amazing to wake up to. To be able to go out on a balcony, see the view was a great way to start the day--along with the amazing breakfast spread. I prefered the noodle bar every am, which changes day to day....but many yummy options. It was worth waking for (I usually sleep in)! The pool is also amazing --sadly too cold for me (winter), but I enjoyed the endless view of sea and sky. I would come back -- BEST LOCATION! GREAT STAFF--hardworking and you can feel their efforts. Danang is one of my favorite cities now and Balcona was a major part in making it an exceptionally memorable trip. Also, shout out to the Manager Hai--she rocked, loved talking to her & all her help. She is awesome! Spent 2 nights in premier seaview. It was very nice & best sea view. Breakfast had various kinds of food to choose, and the staffs were very kind & polite. Some club bar music noise at night but about after 9PM all silent, only sound from sea. And hot water came slowly, should wait a moment. Dear ZHEN, Warmest Greeting from Balcona hotel Da Nang. 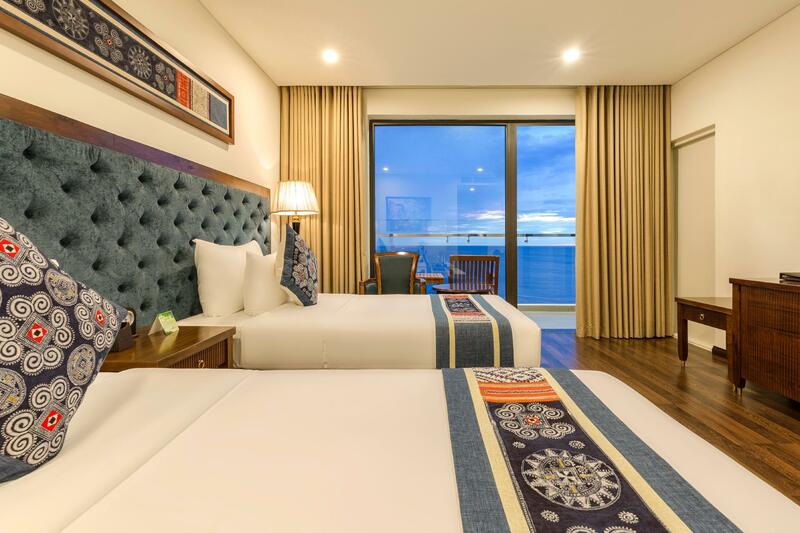 We would like to express our sincere thanks for choosing our hotel for your stay in DaNang It's delighted to hear that your recent stay with us at Balcona hotel was a thoroughly enjoyable experience. It was wonderful to read your comments and rest assured that I will share your feedback with the team who take great pride in ensuring each guest has a memorable stay. However, we are really sorry to hear that there is some noise bother you, we do hope that you will more enjoy with us in next time when you come back Da Nang. Looking forward to welcoming you back to our hotel in the near future. Sincerely, From Balcona hotel Da Nang Team with love. Daisy. Hotel is nice. Breakfeast is good and generous. Pool on the roof top is exceptional. The view is breathtaking. Just to take picture you have to stay in this hotel. However I was there mid of october and it was a bit windy so it was a bit cool to stay longer time in the pool water. Just the road to cross to be on a wonderfull beach. Be carefull in Danand there is waves so for kids below 5 no no possible to swim inside sea. Dear Mathieu, Warmest Greeting from Balcona hotel Da Nang. We would like to express our sincere thanks for choosing our hotel for your stay in Da Nang. It’s delighted to hear that your recent stay with us at Balcona hotel was a thoroughly enjoyable experience. It was wonderful to read your comments and rest assured that I will share your feedback with the team who take great pride in ensuring each guest has a memorable stay. We are looking forward to welcoming you back to our hotel in the near future. Sincerely, From Balcona hotel Da Nang Team with love. Daisy. the view of swimming pool is good but the water was very cool!!!! Dear Saw, Warmest Greeting from Balcona hotel Da Nang. We would like to express our sincere thanks for choosing our hotel for your stay in Da Nang. It’s delighted to hear that your recent stay with us at Balcona hotel was a thoroughly enjoyable experience. It was wonderful to read your comments and rest assured that I will share your feedback with the team who take great pride in ensuring each guest has a memorable stay. We are looking forward to welcoming you back to our hotel in the near future. Sincerely, From Balcona hotel Da Nang Team with love. Daisy. Great location to the beach, really pleasant and clean rooms, and the swimming pool with great ocrean view but the thing that makes this such a good place to stay are the staff. All of the people are incredibly helpful and generous with their time and advice. Dear SEONGHWAN, Warmest Greeting from Balcona hotel Da Nang. We would like to express our sincere thanks for choosing our hotel for your stay in Da Nang. It’s delighted to hear that your recent stay with us at Balcona hotel was a thoroughly enjoyable experience. It was wonderful to read your comments and rest assured that I will share your feedback with the team who take great pride in ensuring each guest has a memorable stay. We are looking forward to welcoming you back to our hotel in the near future. Sincerely, From Balcona hotel Da Nang Team with love. Daisy. Staffs were really friendly and professional throughout our stay. Their command of English was exceptional, provided that the locals don't really speak English. Room was great, no fuss about it. The balcony provided great view of the beach even though we got the seaside room. Breakfast had a fair spread of food and delicacies internationally. Though hotel is slightly far away from the city area, we could just Grab around easily in town for less than 5 bucks. Overall, it was an great experience and will definitely be back again. Thanks to Hai Ha for the great tips and conversation upon check out as well. I felt disappointed to this hotel.The staff service is not good.We hoped that we can get the room early ,so we requested.The staff just said No .Also,we ordered a high floor in the booking, the staff had not keep the room . The service is worse. And I need some water when i have the breakfast,but no one notice. The quality of food in breakfast is not bad,but the environment is not good because of crowded.Also,the staff did not clear the dining table whatever the food dropped in the floor. The view is good whatever night and morning. We ordered the twins bed and double bed ,but it had not arrange and waste a lot of time to solve the problem. Also, the hotel did not have a hot water to bathing .I did not know that the hotel did not have hot water to bathing or our room did not have.The manger called the staff to repair.Finally, the manger asked me that we need to wait 5 -7 minutes to have a hot water.But is is not my ideal answer. Place: very very good Room condion: Really good(See view) But, some staffs are not kind. The didn't lent iron, because they have no that service. And to slice fruit, I have to move 3 places around the hotel. After reporting about the smell, the hotel reception said that they would do something about it , but the sewage smell still lingered for the 2 nights that we stayed there. It was so bad that we had to close the bathroom door to prevent the smell from coming through. Location of the hotel on the beach stretch couldn’t be any better. There’s an excellent seafood restaurant next door and food was reasonable, surprising more value for the money than the normal fried rice and noodles. Nice location , just crossing the road and you will see my khe beach. Reception staff were very nice. Room was clean. Breakfast provided was ok. But the staff collected our unfinished dish without notice. Have a small infinity pool, but the view was so good. 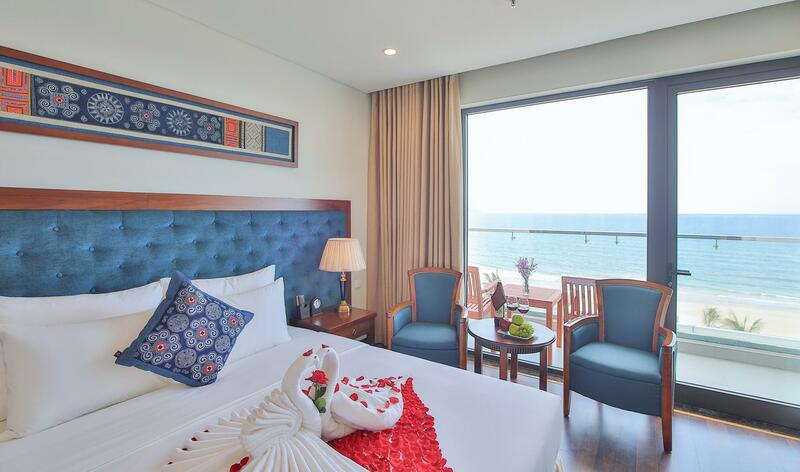 Big room, balcony is in front of the beach, can see the beautiful sunrise & sunset. Helpful staffs , especially Ms. Hai Ha, she introduced us the good Vietnam noodles which is very delicious.